A few weeks back I was walking past a stationary store in Umeda that had a display of several interesting paintings by young artists. I ended up buying two of them, and when the show ended the artists — Ida Masashi (井田 将史) and Vava Mayumi (馬場 万有味) — came down to the store to meet me and present me with their paintings. Both Ida-san and Vava-san have just graduated from the Osaka School of Art and Design (I think that’s somewhat of a proper translation), and now they’re going to try their hands as freelancers. This painting is Vava’s work, and the photograph doesn’t do justice to her subtle and light use of color wash, her white opacity technique, and her delicate use of pencil line. She brought a portfolio of her work to show me, and it turns out that many of her other paintings are imaginary landscapes as well — strangely organic cities that feel like places I’ve encountered in dreams. 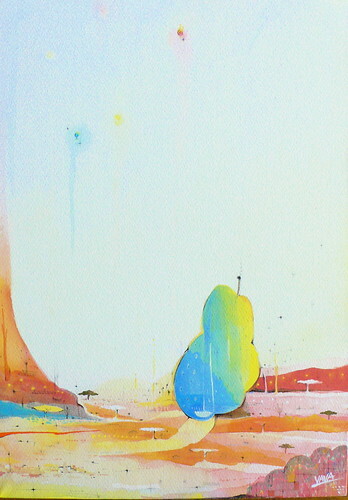 I think the painting pictured above reminds me of some kind of enormous, grinning, bio-pear city. 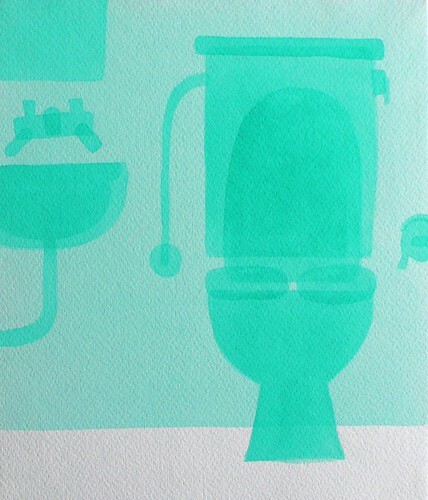 Ida-san says that this painting is the bathroom of his new apartment. He apparently moved recently, and spent the last several months painting the various aspects of his apartment. I love the fact that he only uses a single color here, and it achieves the perfect effect of the calming cool sense of aquamarine that some bathrooms have. This is a picture that Vava-san sent to me — I’m pretty sure it’s a photo of Vava’s and Ida’s graduating class. That’s Vava-san on the left in the pink skirt, and Ida-san right next to her, crouched down in front with glasses and purple ruffles.